Two factors influenced the issues of Bank of Ireland in the period from 1918 through to 1921. 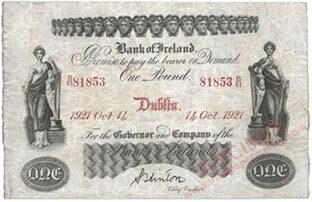 First, the bank’s own process of modernising and altering its banknote issues (commencing in 1918, producing Series F), and second, shortly after Series F banknotes entered circulation, the Bank Notes (Ireland) Act 1920 removed the requirement of banks to make payment on their notes at the branch of issue, stated on the note, as well as at the head office. The requirement to state the branch of payment on a note had lead to all the branches being stated on every note. 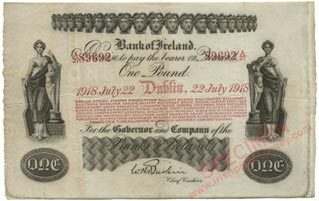 The 1920 Act lead to the removal of branch listings on the notes (producing Series G for the Bank of Ireland issues, which the bank appears to not have considered a new issue). 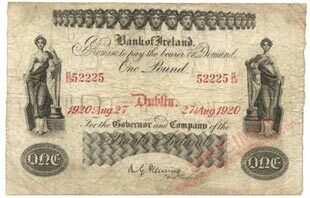 The new 1918 reduced size £1 note was the first significant change in Bank of Ireland’s note issues since ca1880. One Pound notes were reduced in size to approximately 60% of that of previous issues. Higher denomination notes remained large size. These reduced size £1 notes ran for two series before being replaced by a new design, Series H in 1922. Series F and Series G form a sub-group within the overal Bank of Ireland note issues, and are the earliest grouping of Irish banknotes which are feasible to collect in their entirety. 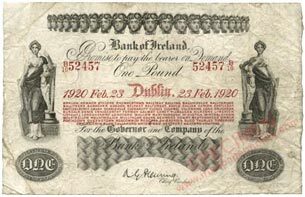 There are 143 dates for the reduced size £1 note, spread across the two varieties of Series F and two varieties of Series G. An example of each date, where available, is presented in the Bank of Ireland reduced size One Pound notes date listing. Ultimately, the aim is to record an image of every date. Some of the as yet unrecorded dates fall between known dates for signatories, and therefore the signatory for the missing date may not be known, as well as the date. A unique date was used for each prefix. The number of dates is known therefore from the highest recorded prefix, which stands at B/62. Prefixes were started at A/10, running to A/99; then B/10, observed to B/62. There are two signature varieties, A.G. Fleming (Type A, 1920), 24 confirmed dates; and S. Hinton (Type B, 1921), 16 confirmed dates. There are four unknown dates which fall within the signature change gap and thus could be either signatory (prefixes B/43, B/44, B/45, B/46), and a further unknown date which could be Series F or Series G (prefix B/18). Series G £1 notes are scarcer than those of Series F.
www.irishpapermoney.com • Version 2.1.0 • Last update • COPYRIGHT ©2000, 2009, 2015, M Mac Devitt. Reproduction with citation permitted.